Are first babies more likely to be light? 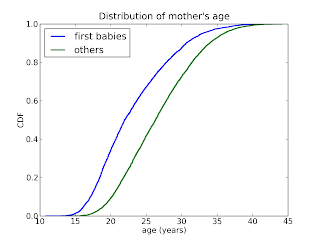 Way back in February I analyzed data from the National Survey of Family Growth (NSFG) and answered the question "Are first babies more likely to be late?" 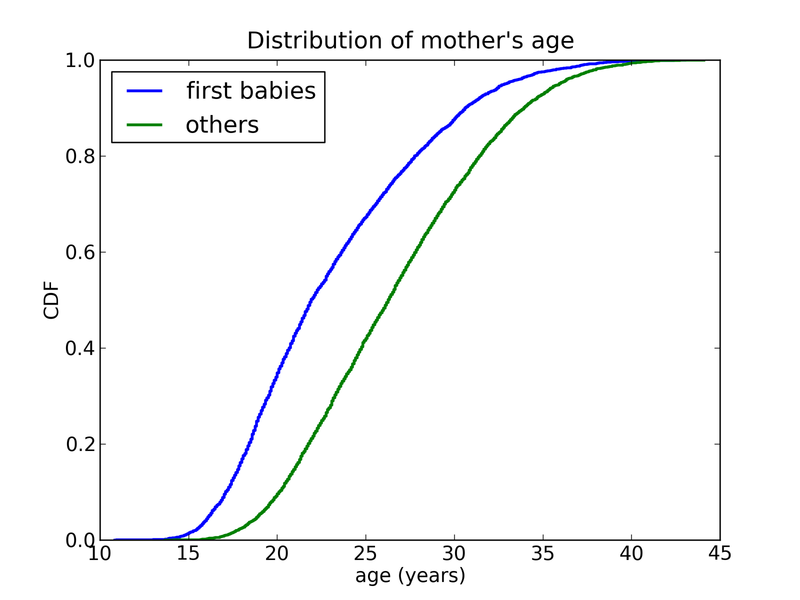 Now I am getting back to that data to look at the related question, "Are first babies more likely to be light?" 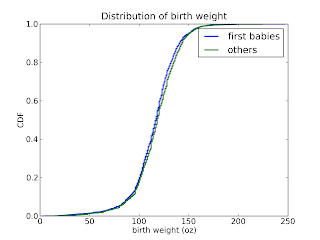 In Think Stats (Chapter 7), I showed that the mean birth weight for first babies is lower than the mean for others by about 2 ounces, and that difference is statistically significant. 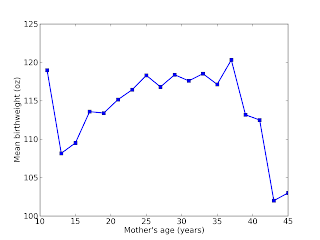 But there is also a relationship between birth weight and mother's age, and the mothers of first babies tend to be younger. So the question is: if we control for the age of the mother, are first babies still lighter? 1) Before looking at relationships between variables, look at each variable in isolation. In particular, characterize the distributions and identify issues like outliers or long tails. 2) Look at the variables pairwise. For each pair, look at CDFs and scatterplots, and compute correlations and/or least squares fits. 3) If there seem to be relationships among the variables, look for ways to separate the effects, either by breaking the data into subsets or doing multiple regression. first, which is a dummy variable, 1 for first babies and 0 for others. It looks like there is a little skew to the right, but other than that, nothing to worry about. The middle of the distribution is approximately normal, with some jaggies due to round-off. In the tails there are some values that are are certainly errors, but it is hard to draw a clear line between exceptional cases and bad data. It might be a good idea to exclude some extreme values, but for the analysis below I did not. There are only two values for first, so it's not much of a distribution, but with categorical data, we should check that we have enough values in each bin. As it turns out, there are 4413 first babies and 4735 others, so that's just fine. There is some space between the distributions, and the difference in means is 2 ounces. It's not obvious whether that difference is statistically significant, but it is, with p < 0.001. Here there is clearly space between the distributions. The difference in means is 3.6 years, which is significant (no surprise this time). We can't take the first and last points too seriously; there are not many cases in those bins. And ideally I should represent the variability in each bin so we have a sense of whether the apparent differences are real. Based on this figure, it looks like there is a relationship, but it might be nonlinear. 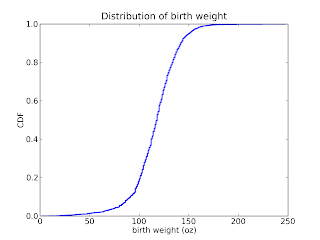 Pearson's coefficient of correlation between age and birthweight is 0.07, which is small but statistically significant. Spearman's coefficient of correlation is 0.10; the difference between the two coefficients is another warning that the relationship is nonlinear. 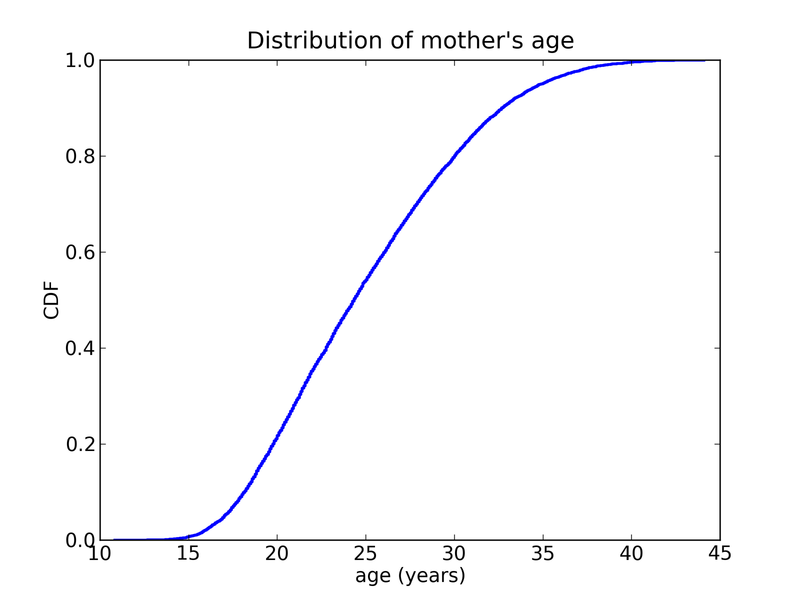 If we ignore the non-linearity for now, we can compute a least squares fit for birthweight as a function of age. The slope is 0.28, which means that we expect an additional 0.28 ounces per year of age. Since first mothers are 3.6 years younger than others, we expect their babies to be 1.0 ounces lighter. 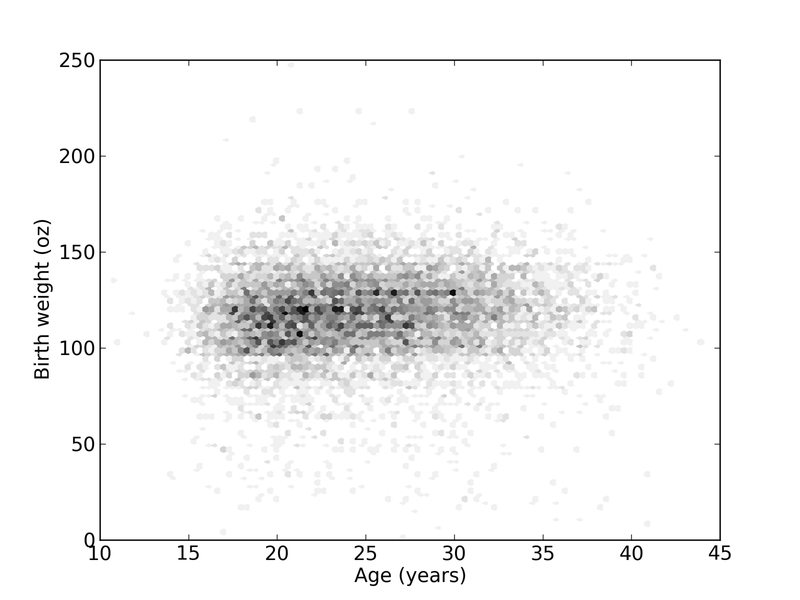 In fact, they are 2.0 ounces lighter, so the linear model of weight vs age accounts for 50% of the observed difference. The standard error provides a confidence interval for the estimates; plus or minus 2 standard errors is (roughly) a 95% confidence interval. The last column is the p-value, which is very small, indicating that the slope and intercept are significantly different from 0. The t-value is the test statistic used to compute the p-value, but I don't know why it gets reported; it doesn't mean much. Since the p-values are so small, it might be surprising that R2 is so low, only 0.0047. But there is no contradiction. 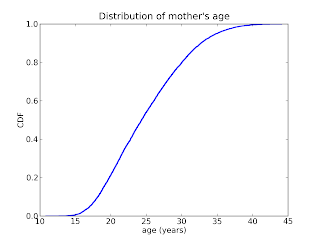 We can say with high confidence that there is a relationship between these variables; nevertheless, birth weight is highly variable, and even if you know the age of the mother, that does not reduce the variability by much. To understand adjusted R2, consider this: if you add more explanatory variables to a model, R2 usually goes up even if there is no real relationship. The adjusted R2 takes this into account, which makes it more meaningful to compare models with a different number of variables. The coefficient for first is -1.1, which means that we expect first babies to be 1.1 ounces lighter, controlling for age. The p-value for this estimate is 2.5%, which I consider borderline significant. The coefficient for ages is about the same as before, and significant. And R2 is a little higher, but still small. We are effectively fitting a parabola to the weight vs age curve. Estimates for both variables are significant. The coefficient for ages2 is negative, which means that the parabola has downward curvature, as expected. And R2 is a little bigger. When we include the parabolic model of weight and age, the coefficient for first gets smaller, and the p-value is 11%. 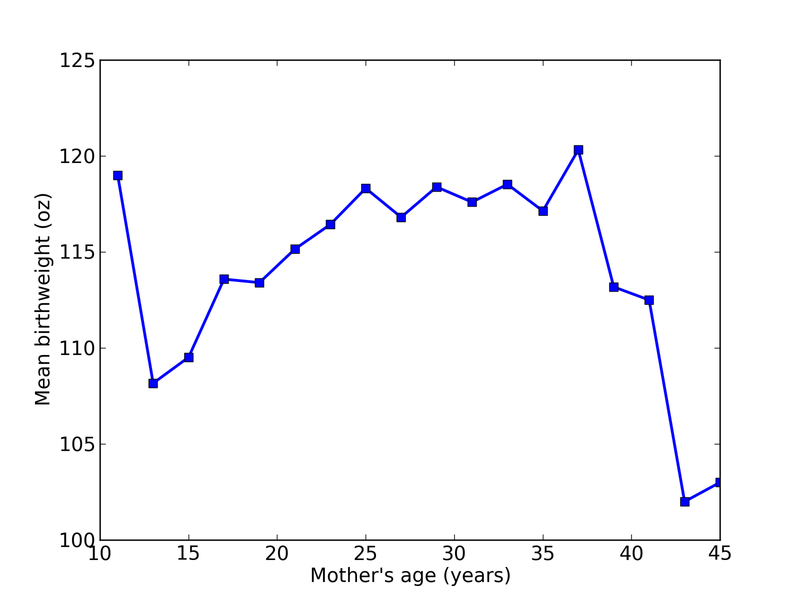 I conclude that the difference in weight for first babies is explained by the difference in mothers' ages. When we control for age, the difference between first babies and others is no longer statistically significant. 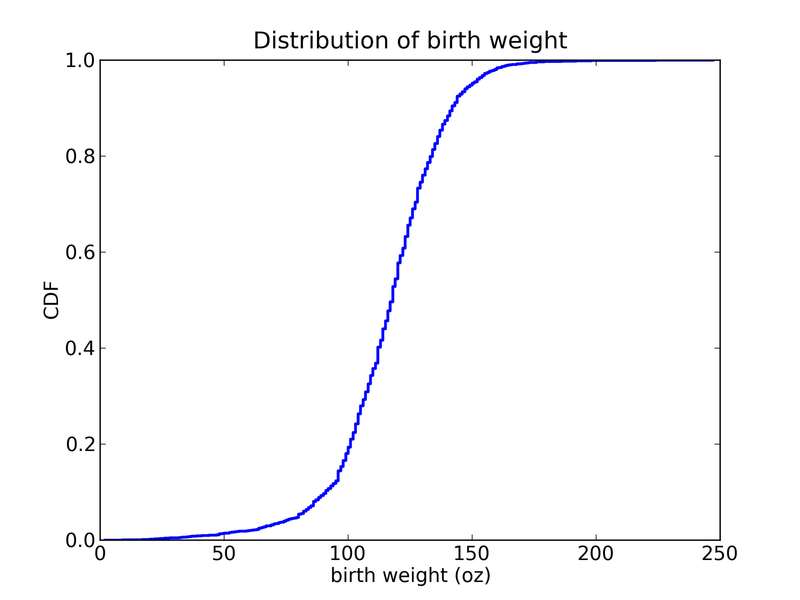 It is still possible that there is a small difference in weight for first babies, but this dataset provides little evidence for it. UPDATE April 2, 2012: I wrote a paper describing this work and submitted it to arXiv. You can download it here. Abstract: We present a Bayesian method for estimating the age of a renal tumor given its size. 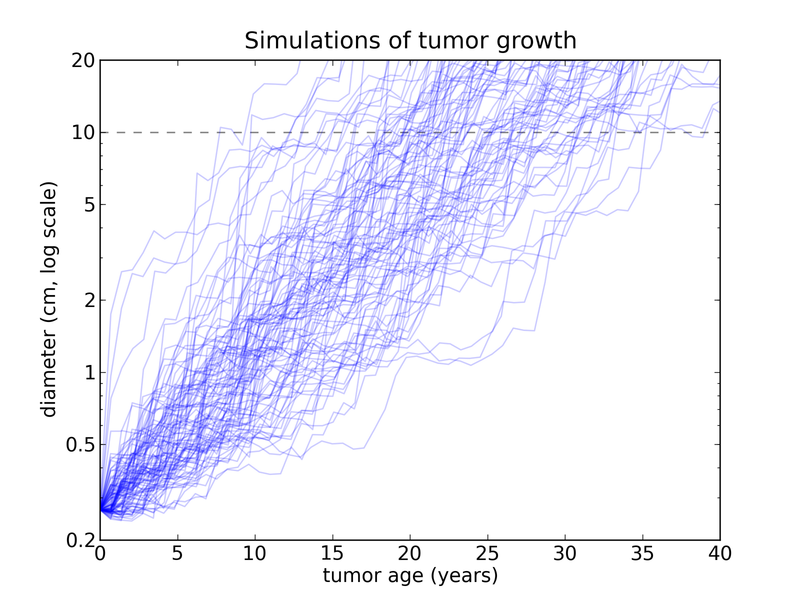 We use a model of tumor growth based on published data from observations of untreated tumors. 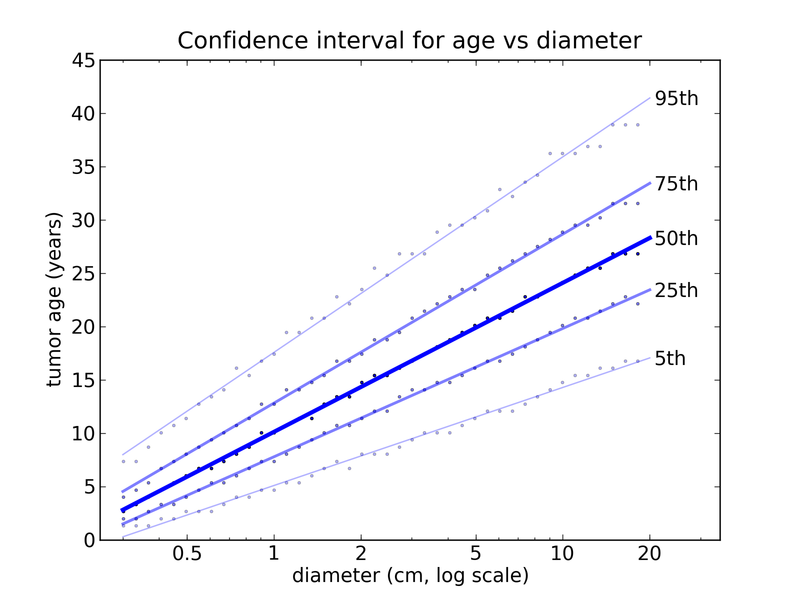 We find, for example, that the median age of a 5 cm tumor is 20 years, with interquartile range 16-23 and 90% confidence interval 11-30 years. "I have Stage IV Kidney Cancer and am trying to determine if the cancer formed before I retired from the military. ... Given the dates of retirement and detection is it possible to determine when there was a 50/50 chance that I developed the disease? Is it possible to determine the probability on the retirement date? My tumor was 15.5 cm x 15 cm at detection. Grade II." I contacted the original poster and got more information; I learned that veterans get different benefits if it is "more likely than not" that a tumor formed while they were in military service (among other considerations). Because renal tumors grow slowly, and often do not cause symptoms, they are often left untreated. As a result, we can observe the rate of growth for untreated tumors by comparing scans from the same patient at different times. Several papers have reported these growth rates. I collected data from a paper by Zhang et al. I contacted the authors to see if I could get raw data, but they refused on grounds of medical privacy. Nevertheless, I was able to extract the data I needed by printing one of their graphs and measuring it with a ruler. It's silly, but it works. The squares are the data points from the paper; the line is a model I fit to the data. The positive tail fits an exponential distribution well, so I used a mixture of two exponentials. 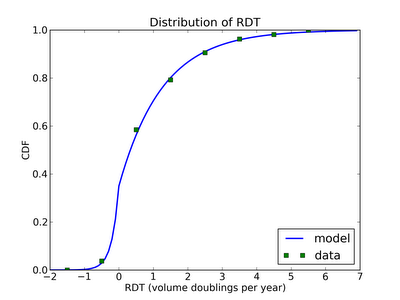 In the largest study I reviewed (53 patients) the median volume doubling time is 811 days. By definition of median, 50% of observed tumors grew faster and 50% slower. By geometry, the doubling time for the maximum linear dimension is approximately (811)(3) = 2433 days or 6.7 years. Therefore, for a tumor with maximum linear dimension 15.5 cm on [diagnosis date], it is as likely as not that the size on [discharge date] was 6 cm. If the diameter of the tumor on [discharge date] were 1 mm and it grew to 15.5 cm by [diagnosis date], the effective volume doubling time would be 150 days. Fewer than half of the tumors in the studies I reviewed grew at this rate or faster, so it is more likely than not that the tumor grew more slowly. Based on this analysis, I conclude that it is more likely than not that this tumor formed prior to [discharge date]. I think this model is sufficient to answer the question as posed, but it occurred to me later (in the shower, where all good ideas come from) that we can do better. 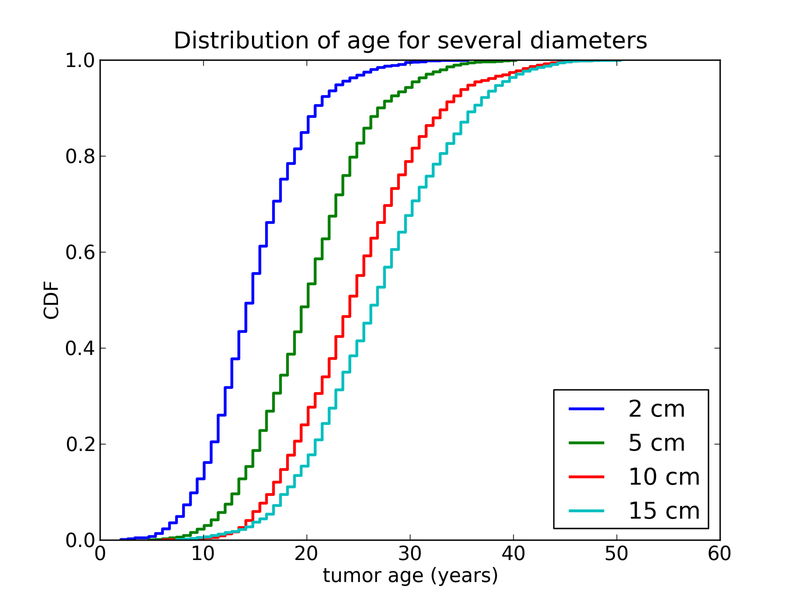 By sampling from the distribution of growth rates and generating simulated tumor histories, we can estimate the distribution of size as a function of time and then, using Bayes's Theorem, get the distribution of age as a function of size. 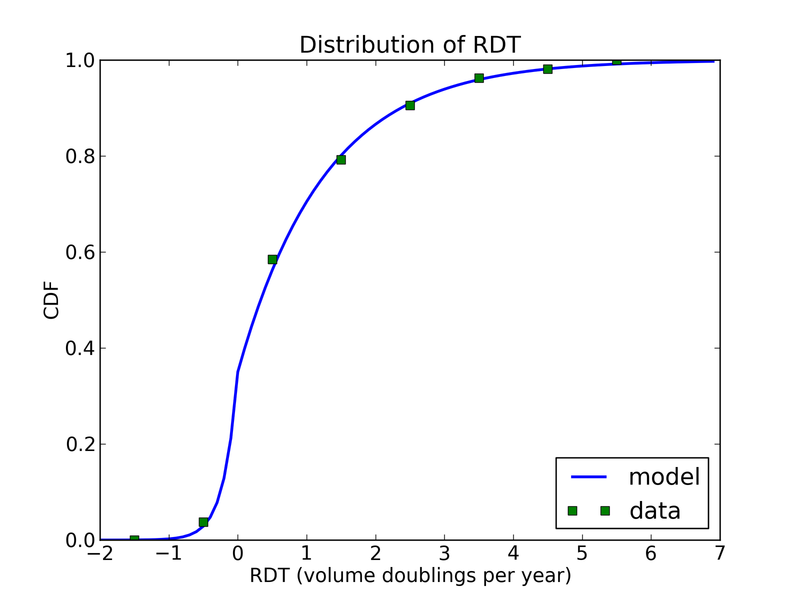 Choose a growth rate from the distribution of RDT. Compute the size of the tumor at the end of an 8 month interval (that's the median interval between measurements in the data source). Repeat until the tumor is 20 cm in diameter. 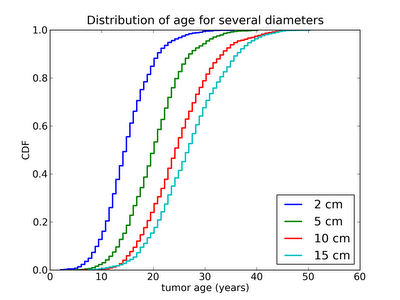 The line at 10 cm shows the range of ages for tumors at that size: the fastest-growing tumor gets there in 8 years; the slowest takes more than 35. The points are data from simulation, which produces some variability due to discrete approximation. The lines are fitted to the data. 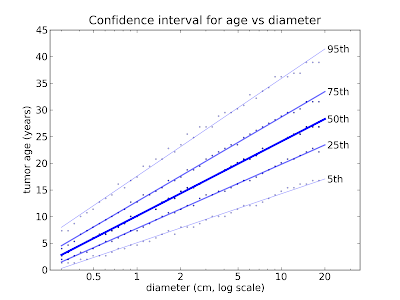 With these results, doctors can look up the size of a tumor and get the distribution of ages; for example, the median age of a 15 cm tumor is 27 years, with interquartile range 22-31 and 90% confidence interval 16-39 years. This model yields more detail than the simple model I started with, but the results are qualitatively similar; a tumor this size is more likely than not to have formed prior to the original poster's date of discharge. It looks like there is also a good chance that it formed prior to enlistment, but I don't know what the VBA makes of that. 1) The factors that limit tumor growth are different for very small tumors, so the observed data doesn't apply. We can extrapolate back to when the tumor was small (I chose 0.3 cm, a bit smaller than the smallest tumor in the study). That gives us a lower bound on the age of the tumor, but we can't say much about when the first cancer cell appeared. 2) The distribution of growth rates is based on a sample of 53 patients. A different sample would yield a different distribution. I could use resampling to characterize this source of error, but haven't. 4) In our model of tumor growth, the growth rate during each interval is independent of previous growth rates. It is plausible that, in reality, tumors that have grown quickly in the past are more likely to grow quickly. by about 3 years. However, if there were a strong serial correlation in growth rate, there would be also be a correlation between tumor volume and growth rate, and prior work has shown no such relationship. There could still be a weak serial correlation, but since there is currently no evidence for it, I ran these simulations with ρ = 0. Comment on "Racism and Meritocracy"
WARNING: This article is on a topic that elicits emotional reactions. I welcome comments, but please make them thoughtful and keep them civil. Eric Ries wrote an article for TechCrunch last week, talking about racism and meritocracy among Silicon Valley entrepreneurs. It's a good article; you should read it and then come back. Although I mostly agree with him, Ries undermines his argument with a statistical bait-and-switch: he starts out talking about race, but most of the article (and the slide deck he refers to) are about gender. Unfortunately, for both his argument and the world, the race gap is bigger than the gender gap, and it is compounded because racial minorities, unlike women, are minorities. To quantify the size of the gap, I use data from Academically Adrift , a recent book that reports the results from the Collegiate Learning Assessment (CLA) database, collected by the Council for Aid to Education, "a national nonprofit organization ... established in 1952 to advance corporate support of education and to conduct policy research on higher education..."
"The CLA consists of three types of prompts within two types of task: the Performance Task and the Analytic Writing Task...The Analytic Writing Task includes a pair of prompts called Make-an-Argument and Critique-an-Argument. "The CLA uses direct measures of skills in which students perform cognitively demanding tasks... All CLA measures are administered online and contain open-ended prompts that require constructed responses. There are no multiple-choice questions. The CLA tasks require that students integrate critical thinking and written communication skills. The holistic integration of these skills on the CLA tasks mirrors the requirements of serious thinking and writing tasks faced in life outside of the classroom. " This is not your father's SAT. The exam simulates realistic workplace tasks and assesses skills that are relevant to many jobs, including (maybe especially) entrepreneurship. On this assessment, the measured differences between black and white college students are stark. For white college students, the mean and standard deviation are 1170 ± 179. For black students, they are 995 ± 167. The fraction of greens in the upper tail is even smaller. If, as Ries suggests, "Here in Silicon Valley, we’re looking for the absolute best and brightest, the people far out on the tail end of aptitude," the number of greens in that tail is very small. How small? That depends on where we draw the line. If we select people who score above 1200, which includes 37% of the population, we get 6% greens (remember that they are 20% of the hypothetical population). Above 1300 the proportion of greens is 3%, and above 1400 only 2%. And that's not very "far out on the tail end of aptitude." Above 1500, we are still talking about 3% of the general population, but more than 99% of them are blue. So in this hypothetical world of blues and greens, perfect meritocracy does not lead to proportional representation. Ries suggests that blind screening of applicants might help. I think the system he proposes is a good idea, because it improves fairness and also the perception of fairness. 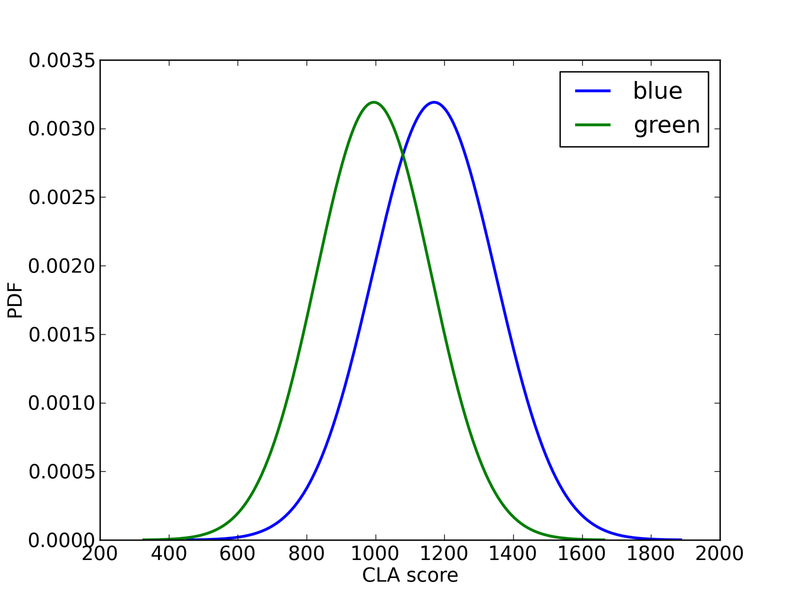 But if the racial gap in Y Combinator's applicant pool is similar to the racial gap in CLA scores, making the selection process more meritocratic won't make a big difference. These numbers are bad. I'm sorry to be reporting them, and if I know the Internet, some people are going to call me a racist for doing it. But I didn't make them up, and I'm pretty sure I did the math right. Of course, you are welcome to disagree with my conclusions. 1) The CLA does not capture the full range of skills successful entrepreneurs need. Of course it doesn't; no test could. 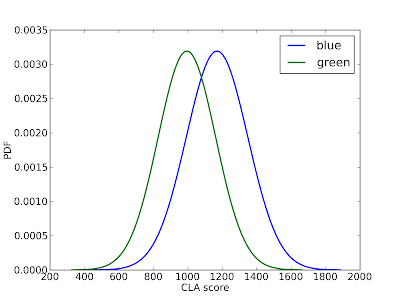 But I chose the CLA because I think it assesses thinking skills better than other standardized tests, and because the database includes "over 200,000 student results across hundreds of colleges." I can't think of a better way to estimate the magnitude of the racial gap in the applicant pool. 2) The application process is biased against racial minorities and women. The statistics I am reporting here, and my analysis of them, don't say anything about whether or not the application process is biased. But they do suggest (a) We should not assume that because racial minorities are underrepresented among Silicon Valley entrepreneurs, racial bias explains a large part of the effect, and (b) We should not assume that eliminating bias from the process will have a large effect. Of course, trying to eliminate bias is the right thing to do, whether the effect is big or small. 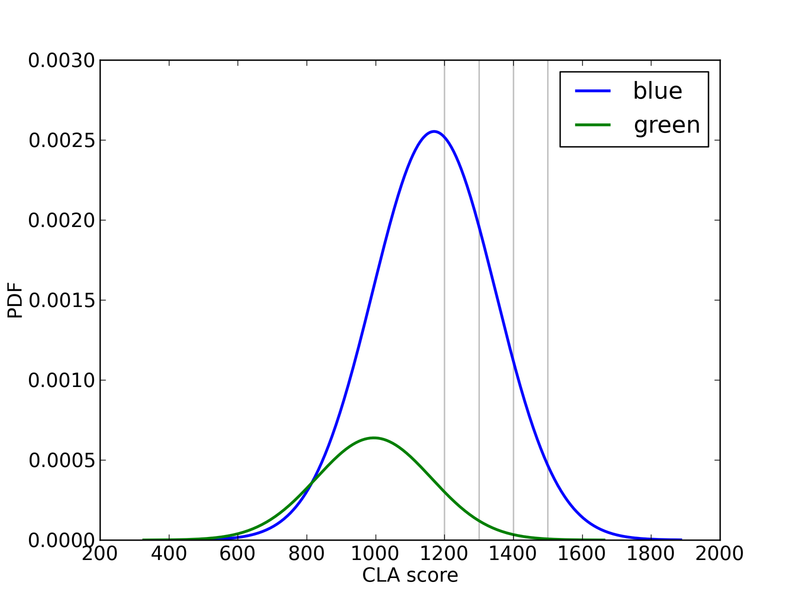 NOTE: The range of scores for the CLA was capped at 1600 until 2007, which changed the shape of the distribution at the high end. For those years, the Gaussian distributions in the figures are not exactly right, but I don't think it affects my analysis much. Since 2007, scores are no longer capped, but I don't know what the tail of the distribution looks like now. EDIT 11-28-11: I revised a few sentences to clarify whether I was talking about representation or absolute numbers. The fraction of greens in the population affects the absolute numbers in the tail but not their representation. "In a family with two children, what are the chances, if one of the children is a girl named Florida, that both children are girls?" In a family with two children, what are the chances, if at least one of the children is a girl with red hair, that both children are girls? About 2% of the world population has red hair. You can assume that the alleles for red hair are purely recessive. Also, you can assume that the Red Hair Extinction theory is false, so you can apply the Hardy–Weinberg principle. And you can ignore the effect of identical twins. Before I present my solution, I want to sneak up on it with a series of warm-up problems. P[GG | two children]: if a family has two children, what is the chance that they have two girls? P[GG | two children, at least one girl]: if we know they have at least one girl, what is the chance that they have two girls? P[GG | two children, older child is a girl]: if the older child is a girl, what is the chance that they have two girls? P[GG | two children, at least one is a girl named Florida]. P[GG | two children, at least one is a girl with red hair, and the parents have brown hair]. P[GG | two children, at least one is a girl with red hair]. If we assume that the probability that each child is a girl is 50%, then P[GG | two children] = 1/4. P[GG | at least one girl] = P[GG and at least one girl] / P[at least one girl] = 1/3. Now there are only two possible families, GB and GG, so the conditional probability is 1/2. Informally we can argue that once we know about the older child we can treat the younger child as independent. But if there's one thing we learn from this problem, it's that our intuition for independence is not reliable. Assuming that Florida is not a common name, x approaches 0 and the answer approaches 1/2. So it turns out, surprisingly, that the name of the girl is relevant information. As x approaches 1/2, the answer converges on 1/3. For example, if we know that at least one child is a girl with two X chromosomes, x is close to 1/2 and the problem reduces to Problem 2. Here B a boy, Gx is a girl with some property X, and G is a girl who doesn't have that property. If we select all families with at least one Gx, we get the five blue squares (light and dark). The families with two girls are the three dark blue squares. If property X is common, the ratio of dark blue to all blue approaches 1/3. If X is rare, the same ratio approaches 1/2. If the parents have brown hair and one of their children has red hair, we know that both parents are heterozygous, so their chance of having a red-haired girl is 1/8. P[GG | two children, at least one girl with red hair, parents have brown hair] = (1 - 1/8) / (2 - 1/8) = 7/15. In this case we don't know the genotype of the parents. There are three possibilities: Aa Aa, Aa aa, and aa aa. 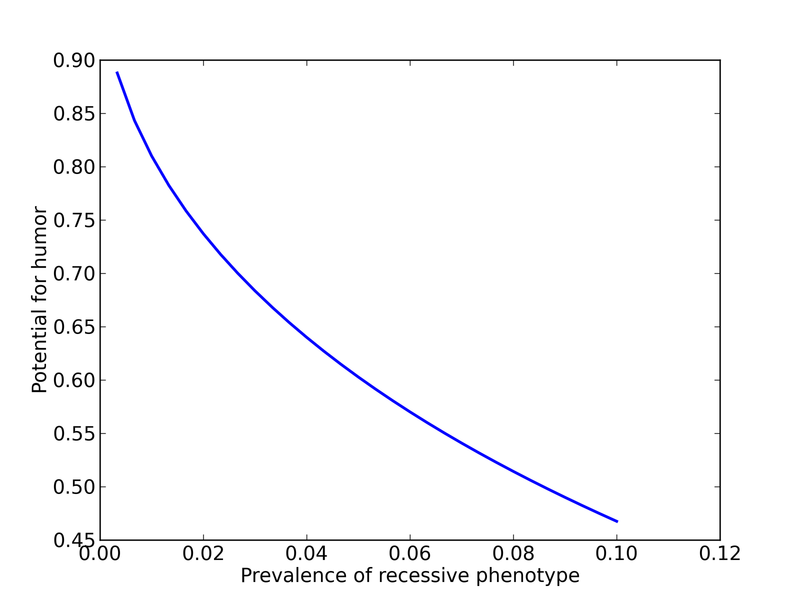 1) Use the prevalence of red hair to compute the prior probabilities of each parental genotype. 2) Use the evidence (at least one girl with red hair) to compute the posteriors. 4) Apply the law of total probability to get the answer. I'm too lazy to do the algebra, so I got Mathematica to do it for me. Here is the notebook with the answer. Congratulations to Professor Ted Bunn at the University of Richmond, the only person who submitted a correct answer before the deadline! At least, I think it's the right answer. Maybe we both made the same mistake. For more fun with probability, see Chapter 5 of my book, Think Stats, which you can read here, or buy here. If you meet a man with (naturally) red hair, what is the probability that neither of his parents has red hair? Hints: About 2% of the world population has red hair. You can assume that the alleles for red hair are purely recessive. Also, you can assume that the Red Hair Extinction theory is false, so you can apply the Hardy–Weinberg principle. 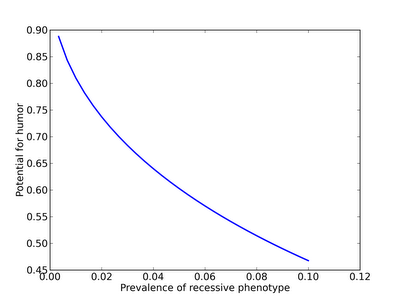 Given the prevalence of red hair, we know what fraction of the population is homozygous recessive. To solve the problem, we also need to know how many are heterozygous and homozygous dominant. I'll use a to represent the recessive allele (or alleles) for red hair, and A for the dominant alleles that code for other colors. p is the prevalence of a and q is the prevalence of A, so p+q = 1. And P(AA) + P(Aa) + P(aa) = 1. That is, the probability that neither parent has red hair is exactly the fraction of the population that is homozygous dominant. Almost 75% of red-haired people come from parents with non-red hair, which might explain why a "red haired child" is a metaphor for a child that doesn't resemble his parents. In the expression, "beat like a red haired step child," some of the humor (for people who find child abuse funny) comes from the suggestion that the parentage of a red haired child is suspect. But why should red hair be funnier than blue eyes or blonde hair? It turns out that we can answer this question mathematically. If the prevalence of red hair were higher, say 10%, most red haired people would have at least one red-haired parent, and that would be less funny. Since I believe I am the first person to quantify this effect, I humbly submit that it should be called "Downey's inverse law of mailman jokes." If you don't get the title of this post, it is a play on "Somebody bet on the bay," a lyric from the minstrel song "Camptown Races." A bay is a horse with a reddish-brown coat, so I thought it was a pretty good fit.